Growing up, I always enjoyed dressing up – usually in military gear, or just as a random bloody accident victim. I started taking costuming more seriously once I saw The Road Warrior and became obsessed with the Mad Max films. In trying to replicate the look of some of the costumes, I slowly built up a skill set, which today includes leather-working, sewing, dyeing, and mold-making, among others. I’ve spent a lot of time researching and re-creating costumes from the Mad Max films, a huge source of inspiration for me. 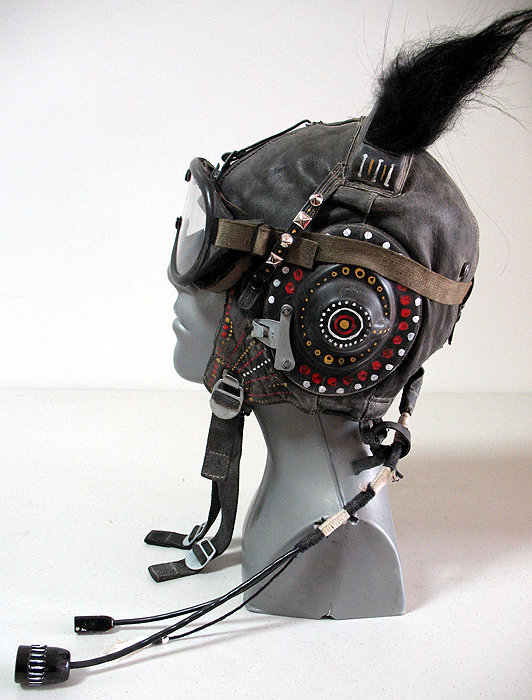 I also find inspiration for post-apocalyptic costumes from things I find. I spend time looking on eBay, image search engines, truck stops, thrift stores, hardware stores, and surplus stores. When you’re re-purposing, it’s always good to be aware of what you have to work with. On a recent trip to a junkyard, I was inspired by the possibilities of using old car seat covers and floor mats. Whenever I find something that looks cool, it’s fun to challenge myself to find a use for it in a costume. A bigger challenge is coming up with a design and then finding parts to match! Such is the case when using historical or traditional dress for inspiration. You can draw inspiration from Japanese or Roman armor, ancient Egyptian dress, Native American headdresses, etc., and then try hunting down the similar modern materials that will result in modern costumes, with subtle nods to those cultures. Sometimes obscure cultures are more fun to use, since the references aren’t as immediately obvious. Post-apocalyptic costume requires a lot of creativity and problem-solving skills. It’s like being the MacGuyver of costuming. You decide on a goal, and then you figure out what you have to use to achieve that goal. And after hours of browsing images online, you find out that an X makes really great Y. What I love about post-apocalyptic costuming is the creative freedom. Basically, you can use anything that looks cool, without having to worry about being period-accurate, or having to hide what the part really is. As a matter of fact, it’s usually good to use parts that are identifiable – because it’s always entertaining and inspiring to see ingenious up-cycling on costumes. Post-apocalyptic costuming also gives you an appreciation for the beauty of worn-out, decayed items. There’s nothing like an old, well-worn pair of boots, or a t-shirt that’s been worn so many times that it has tiny holes all over it. Finding out how challenging it can be to make new items look old just multiplies your appreciation for authentic aging. Two mistakes I made when I was learning to design and build costumes are over-focusing on details, and not making my costume sturdy enough. Details are wonderful and shouldn’t be overlooked in this genre, but you might be better off starting with an overall design concept sketch first. There’s nothing like a photo of your costume after-the-fact to make you realize that your faint, hand-brushed tea stains and careful hand-stitching just doesn’t show up from 10 feet away. But you know what does? Your very plain, uninspiring, monochrome costume concept. Designing as-you-go might be very satisfying, but don’t forget to step back once in a while and look at the big picture. One of my first major Halloween costumes was held together by a lot of office staples. I quickly learned that only a couple hours of walking around put a tremendous amount of strain on leather straps. Don’t overestimate your costume’s durability in what you might think is light wear. Glue those layers together (Barge is a great all-purpose cement for porous layers), then sew it down, then throw a few rivets into it for good measure, especially for areas that hold tension or weight. Rivets do pop off. Sewing does come apart. Build it to last! I tend to go with leather and cottons. Cotton is great because it takes dyes, dusts, bleach, and paints easily and frays beautifully. Denim, duck cloth and muslin are types of cotton fabric. Black knit fleece (hoodie/sweatshirt material) has a nice weight, and looks great faded in the sun and you can cut holes in it to give it a moth-eaten look without it fraying and coming apart. You can sew leather with any sewing machine if you use a leather needle and a Teflon foot. If it fits under the foot, you are good. You may have to help the machine along a little to get the needle through the leather sometimes, but it’s easier than hand sewing everything. Stiff leather can be wet to make it temporarily easier for the needle to get through. For hand-sewing leather, you’ll need an awl to pierce the leather, a large needle and thick thread. Waxed thread and artificial sinew are standard, but you can experiment with waxed dental floss or dental tape, cotton crochet thread, and cooking twine. I’ve always liked dyeing because it can give your garments an authentic, primitive look and it’s extremely useful for aging. I started out using RIT dye and tea for my projects, but I’ve moved to mostly fiber-reactive dyes now. They are professional-grade dyes used in the textile industry. While the apparent need for meticulous measuring might be intimidating at first, there are a lot of advantages to using fiber-reactive dyes. There’s no boiling water – no metal pots to buy. You can dye with room temperature water if you wanted to – and in a plastic bucket. There’s less bleeding since the dyes molecularly bond with the fibers. But the best thing is the control. You can use a spray bottle to spray rich, splotchy patterns onto garments, stain hemlines, and even print designs (using a print paste thickener). In other words, you can use the dye almost like paint, without adding all that stiff, cakey weight to the fabric. I buy my supplies from prochemicalanddye.com, but sites like Dharma Trading Co. are also popular. Both sites offer a variety of textile art supplies, as well as instructional documents and tutorials. 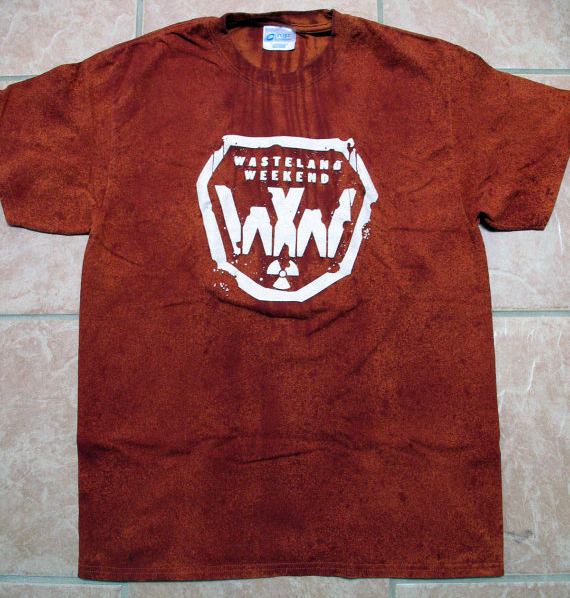 Karol Bartoszynski is a designer and one of the founders of Wasteland Weekend. 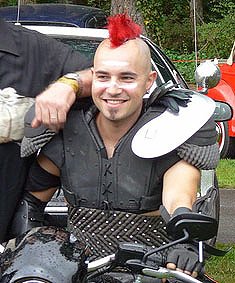 A huge Mad Max fan, he ran the first Mad Max event in the US in 2004, and has compiled costume info on his website MadMaxCostumes.com since 2003. Check out his designs and products on KarolB.com as well as his Etsy shop. He recently launched WADE, a reference website with a lot more tips on weathering, aging, and distressing. Need more information? Send us a note.